Festive Lighting brings excitement and joy to communities across West Sussex and we at SSE are here to help make sure your displays are not only a great success, but most importantly, safe for the general public to enjoy. If you are considering installing festive lighting in a public space you may not be aware of the procedures that are in place and what your obligations are. This website will guide you, step by step, through the process and highlight any extra information you will need to supply with your application. Street lights are designed by their manufacturers to only bear the weight of a lantern and any additional weight, load or attachment added to the street light must be thoroughly assessed prior to installation to ensure public safety. There are 3 stages to completing your SSE Festive Lighting Application, please carefully read the information below before you make your application. APPLICATIONS MADE AFTER THIS TIME MAY NOT BE PROCESSED IN TIME FOR THE START OF THE FESTIVE SEASON. Before you make your Stage 1 Festive Lighting Application check you have . . .
1. A signed SSE Consent Form and Third Party Attachment Agreement? This should be completed and signed by the applicant. Please complete the yellow sections on the form. You can download the forms for a Third Party Attachment Agreement here. 2. An Unmetered Supply Agreement? This is an agreement between you and the power company supplying the energy to the streetlights. They will request the wattage of your decorations, amongst other information, so that they can calculate the amount of energy your decorations will be consuming over the network for the duration of your display. In West Sussex there are two power distribution companies. Depending on the area you reside in this could be either SSE Power Distribution or UKPN. This map will show you which company you need to contact. You will need a new agreement each year you make a Festive Lighting Application. 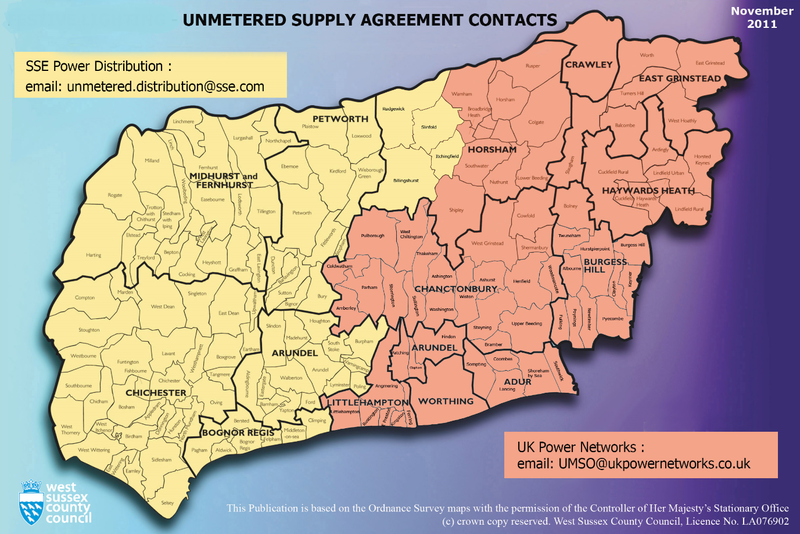 You can download the form for an Unmetered Supply Agreement with UKPN here. You can download the form for an Unmetered Supply Agreement with SSE PD here. 3. A map showing column locations and numbers? Please ensure that the column locations are clearly marked and up to date column numbers are given. You can find an up to date map of our column locations here. 4. The specification of each decoration you wish to install? Please complete a decoration specification form for each design you intend to use and submit these with an accompanying photo or design drawing. All of this information should be available from the decoration manufacturer. Download decoration specification form here. 5. A copy of your £10m public liability insurance. 6. Confirmation that the contractor installing your festive lighting is HERS certified. HERS is the Highways Electrical Registration Scheme that ensures engineers working on street lights have the correct qualifications and safety training. All SSE Operatives require this level of training and therefore this standard is also required for all other third parties working on street lighting infrastructure. Please supply your contractors name and business address as well as a copy of their HERS certificate along with each of the working operatives’ current HERS cards, which should be in date. If you have all of the information above you may submit your Stage 1 application to TPA@sse.com Please submit your application and copies of all the requested information above no later than 1st September to ensure your application is processed in time for the start of the festive season. Please Note! Important Information About the Types of Display Not Permitted. Please submit the information detailed above to TPA@sse.com the team can then begin processing of your application. Our Third Party Attachments team will evaluate the information you have sent us in stage one and two. We may then require that structural tests are carried out on the street lights in your application. If you are advised to arrange for structural tests please read the below information carefully as not all types of structural testing conform to our requirements. We will not be able to approve your application without the correct type of structural testing. What are suitable structural test results? These are undertaken by SSE as part of our maintenance regime. When our Operatives visit a street light, they will visually check for signs of external damage or rusting. These are undertaken by a third party contractor who will test the thickness of the column in various places to ensure it is capable to continue to take the weight of the lantern. These are undertaken by qualified Structural Engineers who will use the Type 2 structural test results (as above) and incorporate them into detailed calculations in accordance with BS EN 40. These are based on the specific decorations you wish to install and confirm the street lights suitability to take the extra load and wind effect of the decoration. To ensure public safety we may ask you to carry out 'Type 3' structural tests and calculations for some or all of the street lights included in your application. The only street lights that do not require structural testing are called "Heavy Duty" which are specifically designed to take extra loading. When making your application our team can confirm if any of your requested streetlights fall into this category. Please note! Important information for your Structural Engineer. A clearance of 2.1 metres must be maintained in cases where Third Party Attachments are erected over a footpath. Within West Sussex this clearance is increased to 2.5m. No part of any sign may be nearer that 0.5m metres to the face of the kerb. It is important that when considering your structural tests, you highlight to your engineer that there is a minimum mounting height of 2.5m if the 0.5m rule has been adhered to. If your decorations sit less than 0.5m from the kerb you will need to consider traffic that could be compromised by lower mounting heights for instance lorries, heavy goods vehicles and buses which would need the height clearance increased to a minimum of 5.7m. Please consider your mounting heights in relation to the above stipulations as the correct mounting heights will be required by the Structural Engineer to complete accurate structural calculations. Please submit your test results to TPA@sse.com The team will complete the processing of your application. You will be notified in writing when your application is approved. Your application approval will be passed to West Sussex County Council Highways team. West Sussex Highways will then contact you if they have any concerns regarding your application.